– said the blurb at the back of the book, and it had me hooked. As regular readers here would know by now that I love historical fiction. And especially about the Tudors who seem to be most colourful(or at the very least, most interesting) of all the monarchs in British history. Mary Tudor is the headstrong, younger sister of Henry VIII. They grew up together, and shared a close bond. When Arthur, their elder brother died, Mary and Henry were there for each other. Henry liked to say that he would rule the country with Mary beside him, helping him. Life in the royal courts are never as they seem. While young princes might stand a chance of becoming king, princesses are mostly bargaining chips. Mary had been betrothed by her father, to a young Charles of Castile when he was still a boy. This wedding did not take place as weddings were all based on political alliances. The political tides had changed, since the time of the first betrothal. Henry, her brother, then betrothed her to King Louis of France, a much older man. Unhappily, with a heavy heart, Mary agrees to marry the King of France, because as a royal princess, she really doesn’t have much of an option. Her heart was in England though, with Charles Brandon, her brother’s best friend. But this is a relationship that would go nowhere. Henry was already upset that his other sister Margaret refused to do her bit for England when she was widowed, so Mary had no options but to follow her royal duty. She did manage to wrangle a last promise out of her brother, just before she left for France, that in case she were to be widowed, she would be free to choose her own destiny. It is all about Mary and Charles’ romance. The risks they took, the chances that they grabbed at, while hoping that one day, they would be able to live the life they both wanted. While the story is mainly about Mary, it is also about Henry VIII as a brother, a side of him, that had been unknown to me, at least. It is interesting how he changes, slowly over time to the person he is now most known for. Mary came across as a woman with a mind of her own, but willing to do what she thought of, as her duty. Even as the Queen of France, Mary did her best, the relationship she shared with the King of France was sweet, rather touching to read. The life of the princesses those days, born into luxury and yet trapped by the traditions and expectations that they had to adhere to. Not easy at all, but then I guess, if we were to look at the lives of the common people, those days, even this would be paradise. While overall the book was interesting, it never came across clearly, as to what really brought Charles and Mary close. The narrative rather felt like a romance where they hated each other and then fell in love, with no real reason why Mary started liking Charles. That was one discordant note in the story of the romance. I enjoyed Mary as a character, but the others, I felt would have been better fleshed out. It touches upon the other happenings in the Tudor world, like Henry’s marriage with Catherine of Aragon which was fraught with all sorts of problems. A quick and interesting read, apart from the few things that didn’t quite work for me, but as someone who enjoys historical fiction, I definitely enjoyed it, and I went back and read more about Mary Tudor, Queen of France. I would give it a 3.5/5. An interesting read, but not the best or something that would stay with me. Diane Haeger is the author of four previous historical novels, including The Ruby Ring and My Dearest Cecilia. She lives in California with her husband and family. The book is available from Amazon(UK) and Flipkart(India). A book I picked up on a lark, assuming that it would be a typical chick-lit. Little did I know how different it would be. Cass, a twenty three year old medical student, has everything to look forward to in life. An exciting career, a wonderful boyfriend, a full life, when a freak accident changes her life completely. She is paralysed from waist down, the boyfriend disappears, leaving just a note, and she can’t think of the future. The everyday things that she once took for granted were huge obstacles for her now. Her family tries their best to keep her spirits high, but it isn’t the easiest task. Frustrated with her condition, and feeling helpless and depressed, Cass needs help and quick. Ticket, a guide dog, turns out to be Cass’ savior. Having Ticket in her life, she suddenly starts to feel more independent. She slowly turns her life around, one day at a time. She starts interacting more and soon meets up with Dom and Guy, friends she had made while at the hospital. Cass, finally starts to live again. Having Ticket in her life, gives her the push that she needed. She starts to feel independent and even ends up traveling to Colorado to ski. It is Cass’s story but it is also so much more. The book takes you through an unbelievable journey. The sadness, the desperation, as well as the determination to live a full life. It had me in tears, so many times. The book is written so well, capturing the lives of people with disabilities like these. Such a tough life, and yet, it is portrayed with so much compassion and empathy that it was a beautiful read. For me, it was such an insight to the lives of those with such disabilities. So many things that we take for granted, are such a huge deal for them, and yet to be positive and live a full life, seems so wonderful. Cass is such a lovely, real, believable character, and so are the others in the book. Every character rings true, and the emotions that they go through, the turmoil and the confusion, at various stages, are so understandable. I love the way the author has handled such a difficult topic. It can’t have been an easy story to write, to get under the skin of a protagonist in a condition like this, and I felt that she did a brilliant job. The book has the right mix of compassion, humour and seriousness. It was a great, positive book to read. 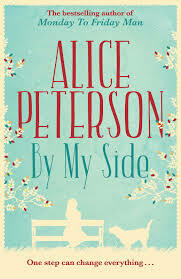 I couldn’t put it down.This was my first Alice Peterson book, but it certainly won’t be the last I would read of hers. Alice Peterson is the author of three very popular books. At the age of eighteen Alice had been awarded a tennis scholarship to America when she experienced pain in her right hand. It was rheumatoid arthritis (RA) and she hasn’t picked up a tennis racket since, a sadness that shall always be with her.The theme of disability features in her fiction, but there is nothing gloomy about Alice or her work. Rather this gives her fiction the added dimension of true poignancy. Of all the books I have reviewed, this is the only one which I actually asked an author for a review copy. How could I not, when it is one of my favourite author’s book? I’ve loved every book of hers so far! Indu Sundaresan was kind enough to send me an e-book as I was not located in the right geography for a proper book. The enchanting story of the Koh-i-Noor, the diamond that captured the imagination of so many people, rulers and common man alike. A tale of loyalty, treachery, duties, betrayals, it has it all. 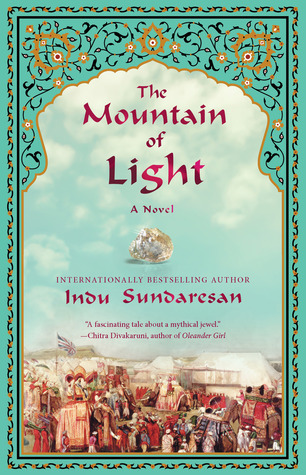 The mountain of Light starts at the time when Shah Shuja and his wife, Wafa Begum are imprisoned, by Maharaja Ranjit Singh, the Emperor of Punjab. The Koh-i-Noor, is the often unseen, but omnipresent protagonist of this historical saga. A tale of the numerous lives touched and affected by the legendary diamond, be it those who owned it, or those who protected it, or those who yearned for it. The majestic yellow diamond, weighing 186 carats was something everybody wanted their hands on, be it the kings in India, or the British. The diamond for all it’s brilliance was also supposed to carry a curse on its wearer. Only women could wear it on a crown, safely. It was said that the curse brought destruction to men who wore it, which is probably why the Mughals had it embedded in the throne and Maharaja Ranjit Singh wore it as an amulet. The story follows the Koh-i-Noor, from the time Wafa Begum held on to it, as a bargaining tool, to Maharaja Ranjit Singh, who kept it safe until he died. After his death, the British took over the Empire of Punjab. Maharaja Dalip Singh, Maharaja Ranjit’s Singh’s eight-year-old son was king only in name, and very soon the Koh-i-Noor was on its way to Queen Victoria, as a ‘present’. Even the journey to England, by ship was not without excitement. The tale then goes on to Maharaja Dalip Singh’s life in England, who followed the diamond to Britain, and finally died in France. The book is a feast of imagery. Sundaresan’s words transport you to the garden where Wafa Begum has secreted the diamond. Her words bring to life, the richness and the power play of Indian courts, the lavish lifestyles that the royals lived. The generosity of gifts that Maharaja Ranjit Singh and his queen bestows on the visitors to their kingdom, took my breath away. How rich India must have been at that time, if they could gift away diamond necklaces and emeralds shaped as grapes! The life of the British in India was really beautifully portrayed. Some who brought their whole homes into India, to set up their British parlour in the heart of India. Others who mingled, blended into the rich tapestry of India, who understood and respected their hosts, some ruthless, while others sympathetic. Each with their own perspectives, some who felt it was their divine right to rule over India, others who understood how unfair that assumption was. British rule in India, and the mechanics of they managed to annex so much of India is brought out really well. The book is a beautifully balanced portrayal of the times. Maharaja Dalip Singh’s tale filled me with such sadness.. A boy, a mere boy, made a puppet king, and then indoctrinated in ways that were totally foreign to him and his culture that he soon becomes as British as they come. Only to realize that no matter how British he felt, he would always be foreign to them. His life changes, even though he was a favourite of Queen Victoria’s. It was such a sad end for someone who grew up knowing that he had the world in his hands. The portrayals of the women in the tale is great. Be it sophisticated Wafa Begum, the clever Maharani Jindan Kaur, the alluring, mysterious Roshni, the British sisters Emily and Fanny Eden, or Lady Login. Despite the number of characters in the book, the author has done a brilliant job of assigning them full characters, none of the characters feel hard done by. And as usual, I cannot even begin to imagine the amount of research that must have gone into writing this book, just like her other books. Especially given the fact that there are so many factual events and characters in the book. It was a book that I took very long to read, by my standards. Not because it was uninteresting, but because I just had to find out more about all the characters that turned up in the book. I kept looking up events and characters that came up in the story. To my surprise and delight, the author has used so many factual events and fictionalized them so well, that one is left wondering what is fact and what is fiction. Just my kind of book. A book that I hoped wouldn’t end. And when it did, I ended up reading up whatever information I could find about that period in history. If anything, I wish I could know a bit more of the Kohinoor before it reached the Mughals, but from the look of it, there isn’t much documentation about it. It makes me wonder what other adventures it must have gone through. Its current resting place, must seem so very boring indeed. I love books that transport you to the times another era, and this was one of the best of the genre. I would definitely recommend it. I would rate it a 4.5/5. Thank you so much, Indu Sundaresan, for the copy of the book. Indu Sundaresan was born in India and grew up on Air Force bases all over the country. Her father, a fighter pilot, was also a storyteller—managing to keep his audiences captive and rapt with his flair for drama and timing. He got this from his father, Indu’s grandfather, whose visits were always eagerly awaited. Indu’s love of stories comes from both of them, from hearing their stories based on imagination and rich Hindu mythology, and from her father’s writings.